Sculptural bottle shaped like a falcon with bluish facets marked the fragrant collection by Police by symbolizing magnificence and elegance. 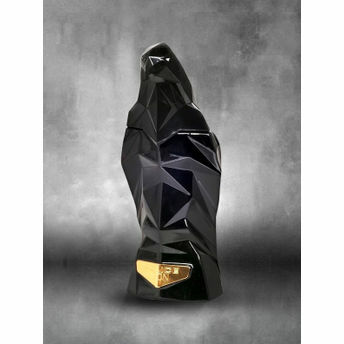 The new edition Icon Intense was announced as a more intense version of last year's fragrance Police Icon and arrives in the same falcon-shaped bottle in black color with a gold-color metal plate. Popular combination of black and gold is still popular and very attractive among perfume bottles. Glass body of the falcon is semi-transparent and you can see inside the bottle. Black glass facets play with light and shadows to create a more attractive presentation of glass bird.